My comments-As i said i am not aware of Focaccia bread but one thing i can say that it looks very Tempting and colorful. Aunty i await ur visit to India!! In a bowl mix olive oil, onions, lemon juice, spices and mustard with a wire whip until thoroughly blended.Brush zucchini, yellow squash, red n green peppers and tomatoes with marinade and let them stand for 2-3 mins. Grill each item (except tomatoes) for 1 min on each side, keeping each vegetable separate and keep tomatoes cool. Cut focaccia bread into 3 horizontal slices, similar t a layer cake.Toast on grill for 30 secs and brush inner surfaces with marinade, now place red peppers, green peppers and tomatoes on bottom slice and cover with center slice of bread.Top with zucchini,yellow squash and cover with top slice of bread. 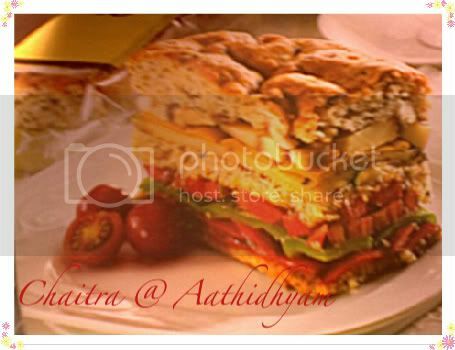 Colourful Focaccia bread sandwich is awaiting for you!! Try n let me know. I love home baked cookies, esp when I have some time in hand I'd love to bake.I love choco chip cookies and I felt it is quite boring to have cookies with choco chips.So, I added some chopped walnuts to pep up. Trust me these cookies are simply melting!! Preheat the oven to 180 degrees. Sift the flour, baking powder,salt and keep it aside.In a large bowl cream the butter until fluffy using electric mixer, to this add sugar and continue beating until the mixture is no longer gritty when rubbed between your fingers and thumb.Add egg contents and vanilla extract and beat on low speed until blended. Now add all purpose flour to the above mixture and blend.Finally, add coarsely chopped walnuts. Shape this dough into small flat balls on baking tray. 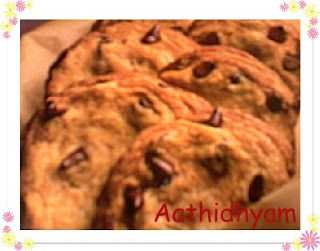 Bake the cookies until golden brown around the edges for about 10-12 mins. Remove, allow them to cool and then serve. You are almost ready just you need to add these ingredients according to your convenience and Yummy kheer is in front of you. First boil milk and allow it to become half.To this add sugar and stir till it dissolves.Now add horlicks mix(horlicks and milk, i suggest go for Horlicks).Meanwhile grind cashew and almonds into paste and add it to boiling milk.Finally add Vermicelli,roasted nuts to milk and allow it to boil till you get the required consistency.Then transfer this mixture into serving bowl and serve. Serving tips-Tastes best when served hot. 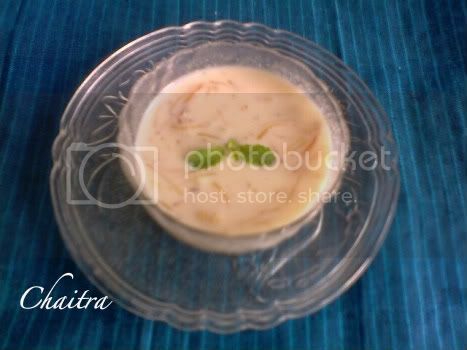 I am sending this Special Kheer to Sri valli's Mithai Mela Event. Also i would like to Congratulate her on her blog's 2nd Anniversary. Sri Valli Keep up the good work!! The Simmering Wok is my virtual space where I'd love to share random ramblings, my cooking experiments, my memories woven around food. So you find a wee bit of everything that I'd call home. What started randomly in 2009 as a time killing hobby turned out to be therapeutic and most importantly what I'd resonate myself with. Well in all honesty - I do that at times when i just dish up something so random that tastes decent but I am in a fix as to how do I sell it to my husband. I have had several upgrades with my . 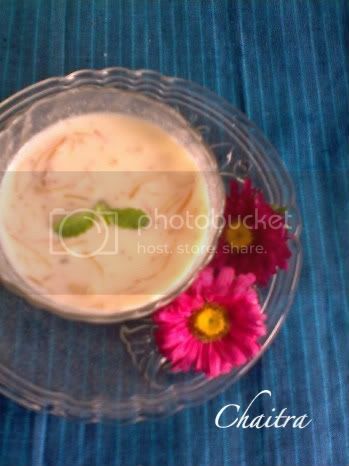 I remember capturing my recipes with a 2.5 MP camera initially for my blog (That was what all I had), so you may see some low quality or hazy pictures as you browse through 2009 collection. Subsequently, I have upgraded mine to 5 MP followed by 13 MP. I own a DSLR now but I still need to learn the tricks and techniques. So grab a cup of coffee and read my blog. Do take a minute and let me know what you feel about my blog or recipes documented here, it cheers me :). Previously The Simmering Wok was known as Aathidhyam under my pen name Chaitra. Get on board, let's cook and click.